The Festival enriches and unifies our community with bold, innovative and relevant productions along with empowering, participatory educational programs, setting the community standard of excellence in educational outreach and performances of Shakespeare’s plays. 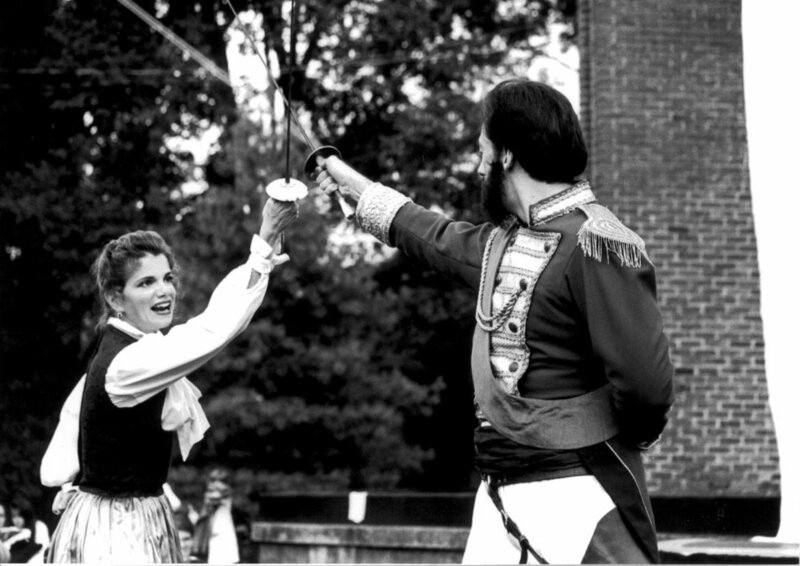 In 1988, a group of local actors led by Chambers Stevens produced the first free-of-charge Shakespeare in the Park production of As You Like It in Centennial Park. The park’s central location was instrumental in making Shakespeare in the Park a success, attracting a wide and diverse audience. Inspired by strong support from the community for the first production, the founders followed up with a second free production in the Park, Pericles in 1989, and the Nashville Shakespeare Festival was born. Local attorney and actor Donald Capparella assisted those founders (who included longtime company member Jill Jackson), and when Stevens left Nashville after Pericles, Capparella was joined by Denice Hicks among many others to create the first professional production of Shakespeare in the Park, The Merry Wives of Windsor in 1990. With Capparella leading the Board and Denice Hicks guiding the artistic vision of the company during its twenty-seven-year history, the Festival has grown into one of the region’s leading professional theatres. Each summer 12,000 to 17,000 people attend the annual Shakespeare in Park production which is designed to be accessible to people from all cultural and socio-economic backgrounds. Since 1988, over 325,000 Middle Tennesseans have attended, and admission has remained free, with donations welcomed at the Park for any who choose to support the Festival. In 1992, in response to the need for an arts-in-education program in the Metropolitan Nashville Public Schools, the Nashville Shakespeare Festival developed its educational outreach program, beginning with a series of fifty-minute versions of Shakespeare’s best-known works as “Shakespeare Samplers.” These abridged productions toured to middle and high schools throughout the state as well as regional colleges and universities. Through the years, The Festival has become a trusted resource for schools by providing enriching in-classroom workshops and creative opportunities for students. Over 195,000 students – many of whom had never experienced live theatre before – have been introduced to Shakespeare through the Festival’s interactive workshops and energetic performances. In 2008, The Nashville Shakespeare Festival began producing its annual Winter Shakespeare production when it was invited to be in residence at Belmont University’s Troutt Theater. The winter production allows The Festival to expand its repertoire to include plays that benefit from a more intimate indoor venue and to provide both public performances and daytime school performances. The first eight winter productions, Hamlet, Richard III, The Tempest, Shakespeare’s Case, Julius Caesar, Macbeth, Othello, Twelfth Night, King Lear, and Romeo and Juliet have served over 46,000 students and adults. The NSF was awarded grants to serve at-risk children, who are given the opportunity to experience these productions free of charge. Following the production, they enjoy a question and answer session with the actors and directors. Some of the most memorable of these sessions occurred after the Julius Caesar and Othello performances, between the students and football star Eddie George who played the title roles. The Festival has also expanded its outreach to include businesses, law firms and adult groups, providing workshops that exercise creative thinking, problem solving, and effective communication through working with Shakespeare’s language, characters, and themes. The Festival’s certified Continuing Legal Education workshops have proven particularly popular as well as a solid source of revenue. The success of the summer and winter productions has made possible many other community events throughout the year, also free to the public. Shakespeare Allowed, offered in partnership with the Nashville Public Library, is now in its 7th year. This event brings together actors, students, professionals, homeless citizens, ESL learners, retirees, and anyone else who wishes to participate in reading Shakespeare aloud. The reading is conducted by the Executive Artistic Director of the NSF, Denice Hicks, and over 3,000 have participated in these public readings that take place the first Saturday each month. Other community events include: Shakespeare’s Birthday celebrated with “The Biggest Balcony Scene Ever” in one of Nashville’s many beautiful public parks and “Scholar Nights” where university professors discuss the plays with a public audience. On September 2, 2018, The Nashville Shakespeare Festival celebrated 30 years of Shakespeare in the Park. Some of the Founders and original company members were there and we captured their favorite memories on video.